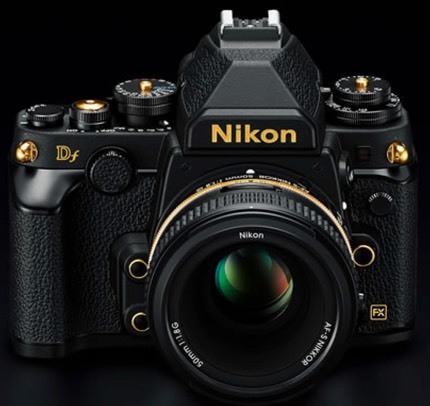 In Japan today Nikon announced a Special Edition of the Nikon Df camera: the Gold Edition. The new version is apparently “to celebrate the one year anniversary” of the Df, and only 1600 units will be produced. I’m sure you’re thinking I’m going to go all ballistic on Nikon for once again succumbing to the color fad that Pentax seems enamored of, but I’m going to surprise you and go another way: this is Nikon’s way of admitting the obvious. The Df is far more a collector’s camera than a shooter’s camera. First, what’s different? Uh, any silver on the original all-black model—and some white, like the Nikon logo—is now trimmed in gold. That includes the Df marking, the neck strap lugs, the rims of most buttons, the shutter release, and even the battery compartment door lock (gold on plastic, yeah that’s classy). You can also get a number of “gold” accessories for the new model (soft shutter release, strap, and 50mm f/1.8G lens, all with gold trim), which will be released in December at a price of 334,800 yen (full kit). If you’re in Japan, you can also get the Front Command dial engraved with your name in gold (or silver). Interestingly, there’s a March 31, 2015 date limit on doing that. If you’re into bling and have some available shelf space, perhaps a trip to Tokyo is in your future, as the camera will only be sold in Japan, apparently. As for practicality, there is none. Indeed, there’s probably negative practicality, as walking around with such a camera while shooting is just likely to attract the attention of thieves (I can hardly wait for the first photo showing someone putting black tape over the Nikon logo on the prism ;~).